Daily Fantasy hockey is all about making informed decisions. Even so-called gut decisions are founded in prior conceptions and opinion. Continually expanding your knowledge and understanding of the sport is vital to success. NHL Hockey’s ongoing analytical and statistical movement offers powerful and innovative ways with which to make sound daily fantasy hockey picks; it’s in exploiting these statistical trends that you’ll find your edge against the competition. One of the Top Daily Fantasy Hockey sites is DraftKings.com. DraftKings is an official partner of the NHL and has some of the biggest prizes for Fantasy hockey players. If you are going to be playing fantasy hockey…you may as well play for the big cash! A rule of thumb for any NHL Hockey playoff pool is to make fantasy selections within contending teams. The most productive player won’t serve much purpose once his team has been eliminated from the playoffs. What’s unintuitive here is that a team’s final placement in the regular season standings is not always the most accurate predictor of post-season success. Goal differential, particularly at even-strength play, is another oft-used evaluator for NHL teams. 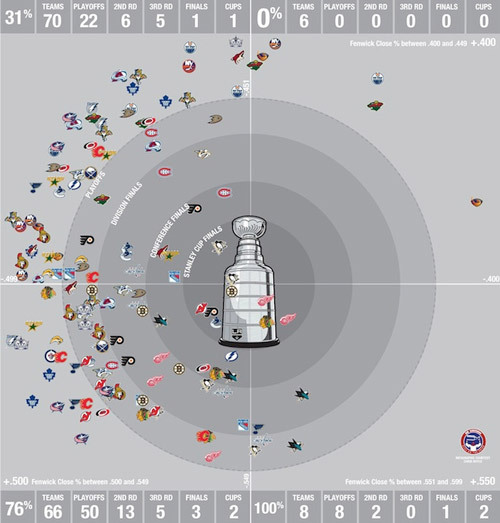 Unfortunately, this metric also falls short as a predictive tool for NHL playoff success. As it happens, it’s a possession metric called Fenclose that holds the most predictive power. Fenclose, a derivative of Fenwick (and by extension, corsi) is much simpler in nature than its reputation would indicate. In essence, it’s a shot differential that considers both those on goal and those missed at even-strength. Fenclose acts as a proxy for puck possession and correlates very well with scoring chances. As the following chart plainly shows, it also has staggeringly good predictive power. As you follow that chart in a counter-clockwise fashion starting from the top right, you see a marked increase in playoff appearances as well as success in the later rounds. What’s perhaps the most telling is, since the 2007-2008 season when these data were first made public, only one team has made the finals sporting a sub-50% rating. The Fenclose analysis is a good stat to look at if you want a better idea of a team’s chances of going deep in the NHL playoffs. The Kings currently lead the league in Fenclose. They might not crack the top-five in the standings, but they’ve got as good of a chance as anybody to make a cup run. The top team in the NHL isn’t even in the top half of the league in possession. Their 50.5% rating has them at 16th behind the Predators. It’s going to be a fantasy feeding frenzy to grab Ducks players, but they’re far from a lock to make the third round. NHL Hockey, perhaps to an even greater extent than other major sports, is a game of luck. Over 60 minutes of game time, randomness and chaos are dominantly influential towards the outcome. Over an 82-game season these effects tend to wash out quite a bit, but in the short post-season they’re particularly important. While it’s not entirely productive to simply attribute all success to “puck luck”, there are ways to identify overachievers using basic statistics. One of those leading the way in hockey’s analytical revolution is Eric Tulsky and in the graphic below, shows how irreproducible on-ice shooting percentages are at 5-on-5. This graph indicates that a team’s Sh% while a player is on the ice is extremely unlikely to remain consistent from the regular season going into the playoffs. It is an unequivocal truth that shooting percentages are primarily driven by luck, and given how reliant a player’s production is on the latter there is a huge advantage to be gained through the ability to identify overachievers. 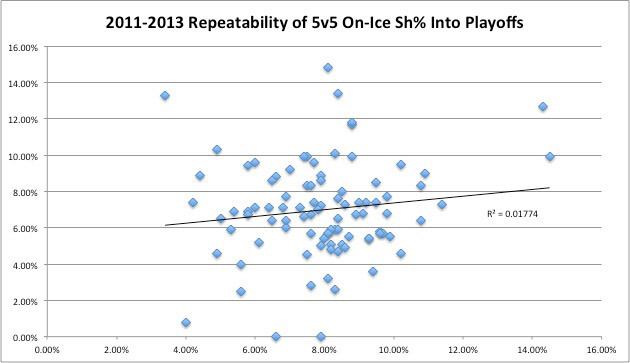 The league average 5 on 5 Sh% varies between 7.0-8.0%. Players with on-ice scoring rates exceeding this mark by a substantial margin are not likely to carry over their inflated production into the post-season. With Dion Phaneuf on the ice, the Leafs are scoring on 11.6% of their 5 on 5 shots and saving 94.6% of shots against. Given what we know about repeatability, I wouldn’t expect that to persist. Special teams, while crucial to success in the regular season, are of particularly vital importance in the NHL fantasy hockey playoffs. Capitalizing on this fact can really provide an advantage over other fantasy players. In each of the last four NHL hockey seasons, the playoffs have seen a larger number of power play opportunities per game than during the regular season. As such, you should place additional emphasis on special teams. Known PP producers will thrive in these conditions. Additionally, teams with poor penalty kill efficiency could find themselves at a disadvantage. Be sure to take this into consideration when making your fantasy hockey picks. In addition to playing on a powerhouse Blackhawks squad, Patrick Sharp ranks second on his team in PP time allocation and PP points behind only Patrick Kane. Despite being a reliable even-strength point producer, Marchand only features in 11% of the Bruins’ PP time and hasn’t registered a single powerplay point all season.